Flood victims: Were Madhesi protests genuine? 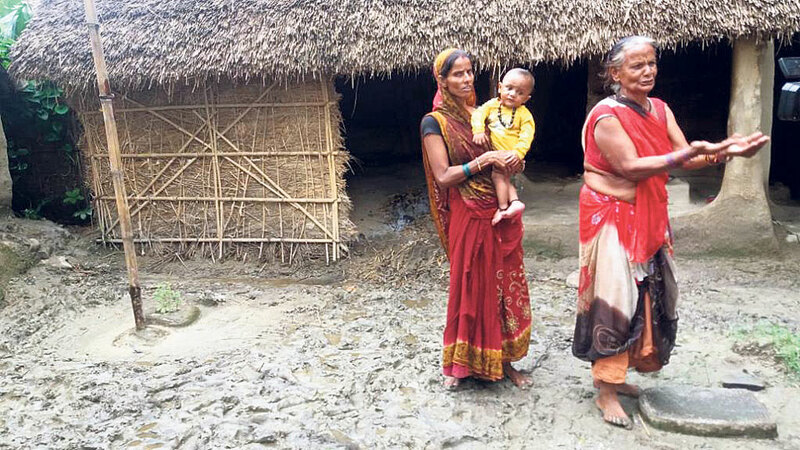 RAJBIRAJ, July 11: Days after the massive floods on July 1 rendered many homeless, life for the locals of Saptari district is yet to retun to normal. The authorities have been unable to respond swiftly, distribute prompt relief or repair the damaged embankments. Members of the general public are still forced to live under the constant fear of more flooding. It has already been five days since the highest authorities of the land, including the prime minister and the home minister, visited the affected areas to observe the plight of the locals. As usual, they offered their sympathy and promises of relief. As the years past have taught them, all the sympathy and promises from the politicians turn out to be empty words, the victims complained. The Madhes-centric political parties are very active in Saptari. During the bloody Madhes movement, the leaders of those parties persuaded the locals to join them and fight the government 'for their rights' now that the country had promulgated a new constitution. The incident at Maleth alone had claimed five lives. And recently, flooding in the Khando River displaced over a dozen Maleth families, according to official records. Flood victims and other locals are venting their anger at Rastriya Janata Party Nepal (RJPN), Federal Socialist Forum (FSN) and other Madhes-based parties and their leaders for turning a blind eye to their plight. Another flood victim, Chandan Jha of Tilathi, said, “The Madhesi leaders don't necessarily have to bring the relief to our doorsteps. But they should have at least attempted to understand our plight. They should pressure the government to address our situation, not just use us for their selfish political aims,” he added. The RJPN presidium has acknowledged that none of the party leaders has reached Saptari to appreciate the difficulties facing the flood victims. Neither FSFN Chairman Upendra Yadav nor any other Madhesi leaders, has reached the settlements of the flood victims in Saptari so far.